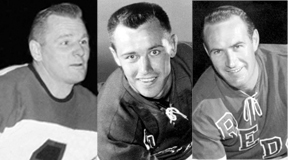 Providence, RI (7/1/2011): The R. I. Reds Heritage Society has named its “Tops Award” selections for 2011-12: Johnny Bower, Bruce Cline and Eddie MacQueen – all great players and generous volunteers for worthy charities in their native Canadian communities. The award’s conditions match the criteria needed to earn the honor dedicated to the memory of the late Zellio “Topper” Toppazzini, voted the greatest player in the Reds’ 51-year history. Though Johnny Bower played only two seasons in goal for the Reds, he led the team to two consecutive the AHL regular season championships in 1956 and '57 and to Calder Cup title in 1956. As Ranger property on loan, both seasons he was voted the AHL's Most Valuable Player and added a third the next season with Cleveland. Later, of course, he starred with the Toronto Maple Leafs and backboned them to four NHL Stanley Cup championships in the 1960s. Today Bower is an icon in Canadian sports. He is the most sought-after speaker for banquets and charity events, and his biography, "The China Wall," is still a bestseller at bookstores throughout Canada. Bruce Cline was a mere 23 years old when he joined the Reds as a N. Y. Rangers farmhand in 1955-56. As a teammate of Bower in that Calder Cup winning season, Cline played mostly with Red Johansen at center and Jimmy Bartlett on the left and netted 27 goals to earn the AHL’s vote as "Rookie of the Year." Still Ranger property, Cline played another four years with the Springfield Indians as a line-mate with Bill Sweeney and Bill McCreary (both former Reds). There he was able to chalk up three more Calder Cup rings (1960, 61 and 62). After that Bruce played three more years with the Hershey Bears before retiring with four championship rings. Within a few hockey teams there emerges a versatile gem. For the Reds in the late 1950s through the mid-1960s that hero became Eddie MacQueen, whose many talents at forward and defense, including fisticuffs, allowed his coaches to spot play him wherever and whenever needed. If there were a "7th Player Award' back then, it would have gone to MacQueen. Few know that the Reds acquired MacQueen from the Rangers for Bower in one of hockey's strangest, most complex deals ever. MacQueen served the Reds well for eight seasons and became a local fan favorite, playing those spot positions, including point man on the Reds power-play, utilizing his sizzling shot. He finished hockey with six great seasons in Baltimore with ex-Red coach Terry Reardon as his mentor. Bower, Cline and MacQueen will receive their Tops Awards at the R. I. Reds Heritage Society's 11th Annual Reunion celebration at Goddard State Park in Warwick on Sunday, August 7, starting at noon. The society's reunion committee has announced the annual reunion event has to date already sold 204 tickets of the capacity of 300. Deadline for reservations is July 16. No tickets will be sold at the gate.